Mary Tudor, Queen of France and Duchess of Suffolk. The spirited Mary Tudor was the beautiful third daughter and fifth child of King Henry VII and Elizabeth of York, She was the couple's youngest surviving child and was born on 18th March, 1496 at Richmond Palace. Mary's mother died in childbirth when she was but seven years old, and she was fourteen when her father died. She was to become very close to her brother, King Henry VIII, who named his famous warship 'the Mary Rose' in her honour. Mary shared her elder brother's exuberant and willful nature, in common with him, she enjoyed dancing, masques, and parties. 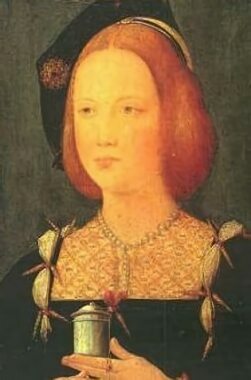 Mary was considered one the most attractive princess in Europe at the time, she had her mother's red-gold hair with grey eyes and an extremely pale complexion which was favoured at the time. By the Treaty of Calais, her father, Henry VII had arranged her betrothal to Charles of Habsburg, later Holy Roman Emperor and King of Spain. Charles was an unattractive youth, with the large and jutting Habsburg jaw, which he later concealed with a beard. Their wedding, however, failed to take place, due to shifts in the political alliances of the European powers at the time. A second prospective husband for the then eighteen year old Mary was chosen by Henry VIII, as part of a peace treaty negotiated by Cardinal Wolsey with France in 1514. Mary was said to be highly reluctant to marry the King of France, Louis XII, who was at the time 52 and suffered from gout. Nevertheless, a proxy marriage was arranged, where the Duc de Longueville stood in for the French king, he afterwards lay down on a bed with Mary and touched her with his naked leg as custom dictated. Mary extracted a promise from her brother that if she went through with the marriage to Louis, she would be allowed to choose her next husband for herself. After delays due to storms in the channel, Mary was sent to France, travelling from Dover to Boulogne on 2 October, 1514 her future husband was eager to receive her, telling the English Ambassador that he had many gifts for his bride and expected a kiss for each one. Their marriage was celebrated on October 9, at Abbeville. Most of Mary's English entourage were sent back to England, but she was left with a few English attendants, including the sisters Anne and Mary Boleyn. The King of France had no direct heir to succeed him and was eager to produce a son by his highly attractive young English bride, but Louis died suddenly and abruptly but eighty-two days later, on January 1, 1515, reputedly worn out by his exertions in the bed chamber. "Sir, I beseech your grace that you will keep all the promises that you promised me when I took my leave of you by the waterside. Sir, your grace knoweth well that I did marry for your pleasure at this time and now I trust you will suffer me to marry as me liketh for to do... wherefore I beseech your grace for to be a good lord and brother unto me" She added that if her brother did not keep the promise he made, then she would enter a nunnery and "never no man shall joy of me". The willful Mary, now Queen Dowager of France, was secretly in love with the handsome Brandon and rather than be married off in a further political alliance, persuaded Brandon, who was understandably torn between fear of Henry and his desire for Mary, to marry her. He accepted and they were married, in defiance of the wishes of Henry VIII, but with the conivance of Francois I, the new French king, at a secret ceremony in the small chapel of the Palais de Cluny on 3 March, 1515. The wrath of her formidable brother had then to be faced who flew into a rage on receipt of the news, threatening to behead Brandon. In the eyes of her contemporaries, Mary had married far beneath her station. Charles' father William Brandon had been the standard-bearer of Henry VII and had been killed in his service at the Battle of Bosworth by Richard III . The couple were eventually forgiven through the intercession of Cardinal Wolsey, although they had to forfeit a heavy fine. They were married again, amidst feasting and celebrations in the presence of the king and queen at Greenwich Palace on 13 May. (1) Lord Henry Brandon (11 March 1516 - 1522). (2) Lady Frances Brandon (16 July 1517 - 20 November 1559), who married Henry Grey, Marquess of Dorset and became the mother of the nine days Queen, Lady Jane Grey. (3) Lady Eleanor Brandon (1519 - 27 September 1547), who married Henry Clifford, 2nd Earl of Cumberland. (4) Henry Brandon, 1st Earl of Lincoln (c. 1523 - 1 March 1534). Mary lived a quiet life in the country, although was known to have been present at the famous Field of the Cloth of Gold at Guines, near Calais in 1520, where her beauty was much remarked upon. Often referred to as the French Queen, rather than the Duchess of Suffolk, she was known to dislike Anne Boleyn and in defiance of her brother, was to prove a firm supporter of her sister-in-law, Catherine of Aragon, in the matter of Henry VIII's annulment of his marriage to his first wife. Mary visited London for the last time to celebrate the wedding of her eldest daughter, Lady Frances Brandon to Henry Grey, Marquess of Dorset, who descended from Thomas Grey, the elder son of Elizabeth Woodville (Queen of Edward IV) by her first marriage to Sir John Grey. 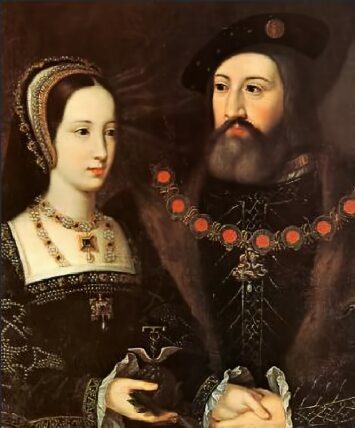 Frances and Henry were to become the parents of the nine day queen of England, the ill fated Lady Jane Grey, who was executed on the orders of Queen Mary I. After suffering failing health for some years, Mary Tudor died on 25 June, 1533 at the age of thirty eight at Westhorpe Hall, Westhorpe, Suffolk, possibly of cancer. Henry VIII had requiem masses sung at Westminster Abbey for the repose of her soul and she was given a magnificent funeral, which her husband did not attend. Her body was interred at the Abbey of Bury St Edmunds. During the Dissolution of the Monasteries her body was translated to nearby St. Mary's Church, Bury St Edmunds. Her grave was disturbed in 1784, during alterations to the church, when her coffin was opened and quantities of red-gold hair were discovered. Her son Henry Brandon, Earl of Lincoln died shortly after. Her husband remarried for a fourth time after Mary's death, to the fourteen year old heiress Catherine Willoughby de Eresby, by whom he had two sons, Charles and Henry Brandon. Charles Brandon died on 22 August 1545, eighteen months before the death of his brother-in-law Henry VIII. Lady Catherine Grey (1540 -1568). 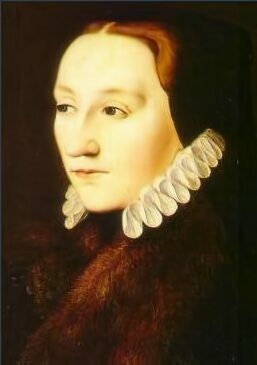 Lady Mary Grey (1545 - 1578). (3) Lady Eleanor Brandon (1519 - September 27, 1547) m. Henry Clifford, 2nd Earl of Cumberland. Charles Clifford. Died in infancy.